Pirate radio in Scotland in 1978 consisted of one or two known stations. There was at the time one station on SW that was not particularly well known as being from Scotland. That station was Radio Mercury International, which used the old FRS address of PO Box 41, Dedemsvaart, Holland. The "Scottish" half of the station was almost raided in Kilbirnie, Ayrshire in early 1979. But for the GPO getting stuck in snow in the street the station was operating from at the time, that may have been the end. By mid 1980, free radio on SW was alive and kicking, with no less than five stations representing haggisland!! The following press cutting was found in the "POST" IN 1982, (Listed here for months in error as THE ADVERTISER). Nothing came out of this, whatever it was meant to be. Neither did we ever find out who was behind it, but the name Guerilla Radio sounded more like a political claundestine station than anything else. It also sounded like at an hour every three weeks, it would have been very difficult to build up an audience. 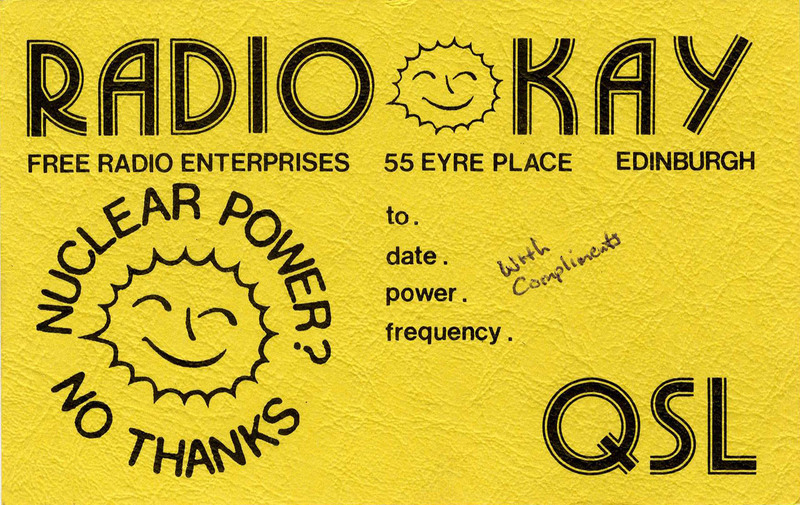 Radio Kay was heard in 1981 on 1413khz. Not a lot is known about this station. 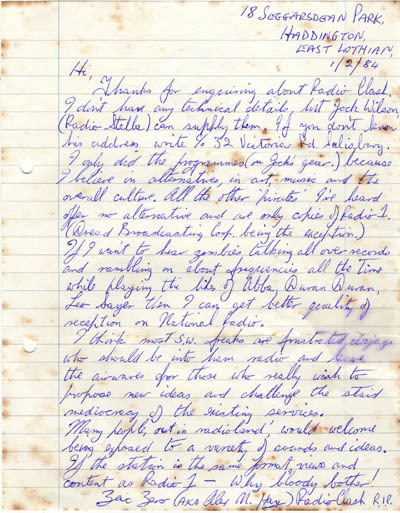 Radio Active was heard in 1984 while listening to a new Irish MW station, called South Dublin Radio on 1242khz. Suddenly a strong carrier came on top, followed by non stop "Raffer's Delight" by the Sugar Hill Gang. This strong test transmission was interrupted by a voice announcement, by a Scottish announcer, followed by an English spoken announcer. Years later, I met someone that reconed this station was from A-y-r, and run by someone that had mobile discos at that time. The story teller earned the nick name of Mr Active after that. Local folks thought it was because he was lazy!! LOL.. I wonder why they never made any further transmissions??? 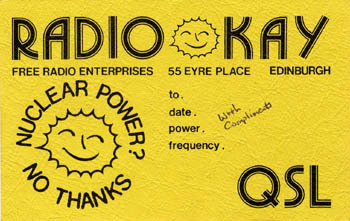 Radio Gladice was heard in the Glasgow area in 1989..ish?? The station seemed to be run by an English spoken announcer from the Merseyside pirate radio scene. Signals were off channel on 1248khz, itself an old Merseyside channel. 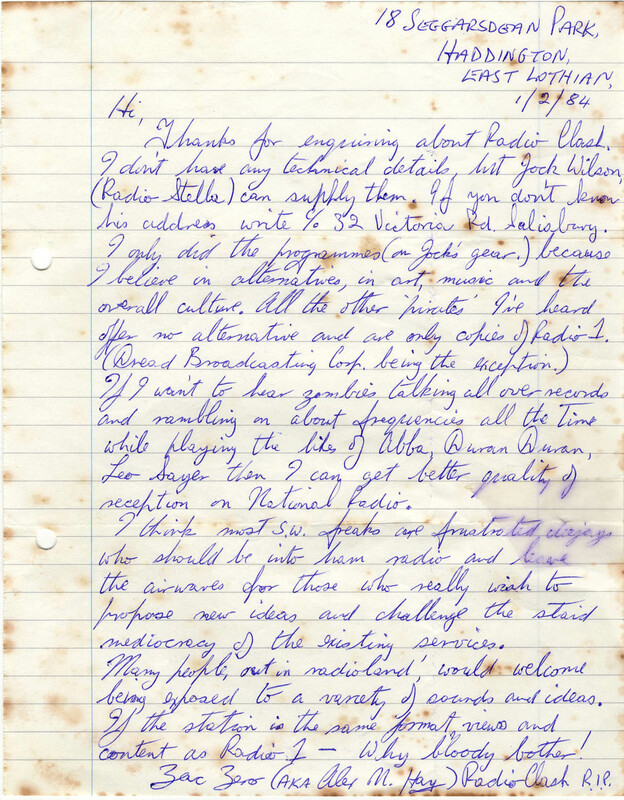 Radio Clash was on the air via the Radio Stella transmitter in 1983/4.